I've been cleaning my studio like a mad woman, getting ready for Addy and her mommy to visit next week. Lots of old magazines and books being donated to the local library; craft projects getting organized and up off the floor (thanks to the hanging rack hubby built me). But I do have a couple of FO's to show off. 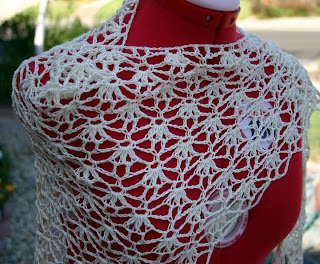 This is wedding shawl #1 - my all-time favorite shawl pattern done in Tahki Cotton Classic. I'm making three shawls using the same pattern but different yarns; this one is for the groom's grandmother. Love the drape and texture of this yarn. Wedding shawl #2, for the mother of the bride, is done in Crystal Palace's Panda Silk. 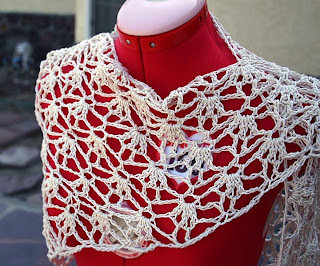 It's almost the same color as #1, but the yarn is thinner and lighter; the shawl almost floats in the air. I'd used the DK size of Panda Silk for another project and hated how splitty it was. This stuff was heavenly. 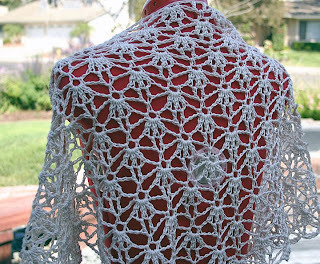 So soft and silky; a real pleasure to crochet. 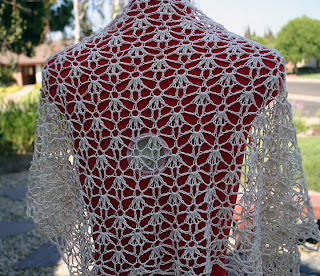 I should have the bride's shawl done later this week, if I don't get too caught up in the cleaning.